As new cereal varieties and health foods companies are quickly entering the marketplace, consumer appealing packaging has never been more important. Let Layfield Flexible Packaging customize a package that feature: brilliant colors; sharp images and text; and visual variety to help you stand out on the shelf utilizing high-definition (rotogravure) printing capabilities. When packaging cereal and grains, one of the most important quality is to maintain its crispiness and texture. Layfield packaging experts develop packaging structures that manage moisture gain/loss, oxidation, and aroma and odor transfer. 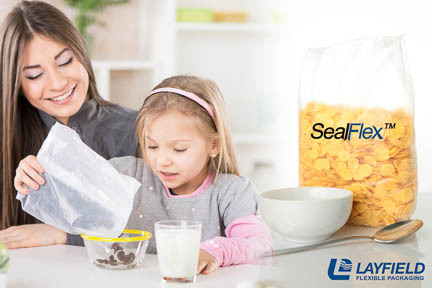 Layfield’s non-printed bag-in-box liner film has amazing seal integrity yet is easy to open and peel.